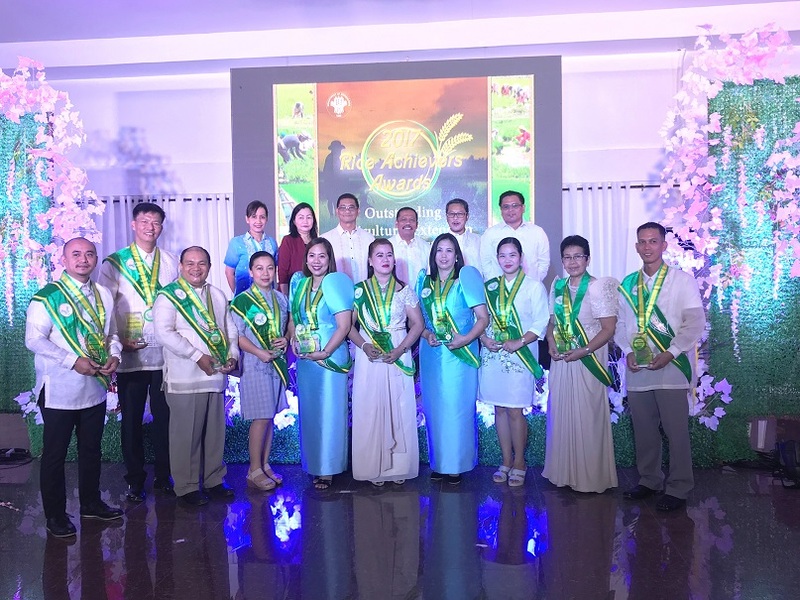 The awardees for the Outstanding Agricultural Extension Worker (AEW) category with ATI Region IV-A Center Director, Ms. Marites Piamonte Cosico and DA-RFO officials. MATAAS NA KAHOY, Batangas - The Department of Agriculture recognized the significant contributions of Agricultural Extension Workers (AEWs) and Local Farmer Technicians (LFTs) from Luzon B-Cluster in the recently concluded 2017 Rice Achievers Awards. Meanwhile, Nicanor C. Paglinawan from San Narciso, Quezon was a sole awardee in the Outstanding Local Farmer Technician (LFT) category. Representing the awardees from CaLaBaRZon, Ms. Tessa Mar L. Espino in her response thanked the Department, DA-Regional Field Office, and ATI Region IV-A and for the support and recognition. "Batid po nating mga pina-rarangalan ngayon na ang kabuluhan po ng mga ganitong programa ay higit sa nararamdaman nating kilig, galak at award. Ang kabuluhan po ng Rice Achievers Award ay ang hamon po sa atin na lalo pang pag-butihin ang ating mga trabaho, upang mapataas po ang produksyon ng palay, upang mapasigla ang pagpapalayan sa ating lugar, at lalo't higit, matulungan ang ating mga magsasaka" she added. The awardees received a plaque of recognition and P 20,000.00 cash prize. ATI IV-A Center Director Ms. Marites Piamonte- Cosico, with DA officials, Mr. Milo D. Delos Reyes, Mr. Ronnie F. Panoy were among the guests who graced the awarding ceremony. The 2017 Rice Achievers Awards was held on July 31, 2018 at Shercon Resort and Ecology Park, Barangay San Sebastian in this municipality.